Downes Transport is a family owned and managed business based in Amesbury, Wiltshire. The business was established in 1995 by its owner Douglas Downes who himself has over 30 years experience in the haulage industry. In November 2007 we launched the Ltd company and appointed myself as managing director and my son Craig Downes as company director who has been part of this business also from a young age. Our business is conveniently located at the Boscombe Down Business Park right on the A303 linking the south west and london, Serving a wide customer base we are able to provide a full array of pallet distribution services to anywhere in the world. We pride ourselves on offering a professional efficient and personal service, which is tailored to suit each customers individual circumstances and needs. 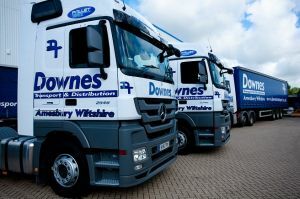 Downes Transport are a share holder member of pallet - track ltd and also a proud member of the road haulage association.